The 11th International Conference on X-Ray Lasers had contributions in the following topical areas: Transient Collisional X-Ray Lasers, Table-Top High Repetition Rate X-Ray Lasers, Optical-Field Ionised (OFI) X-Ray Lasers, Theory and Simulation of X-Ray Lasers, High Order Harmonic Generation, XUV Optics and X-Ray Laser Applications, Capillary Discharge X-Ray Lasers, Alternative Sources of coherent XUV Radiation. 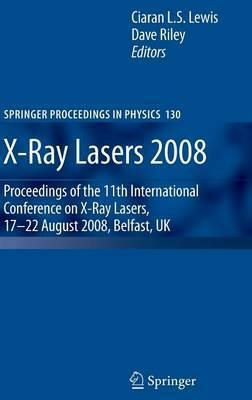 The proceedings of this conference constitute a comprehensive source of reference for scientists involved in researching the development and application of coherent X-Ray sources. Illustrations note XV, 562 p.
This book provides a thorough account of the current status of achievements made in the area of soft X-ray laser source development and of the increasingly diverse applications being demonstrated using such radiation sources. There is significant effort worldwide to develop very bright, short duration radiation sources in the X-ray spectral region - driven by the multitude of potential applications in all branches of science. This book contains updates on several different approaches for comparative purposes but concentrates on developments in the area of laser-produced plasmas, whereby transient population inversion and gain between ion states is pumped by optical lasers interacting with pre-formed plasmas. The most significant development here is the demonstrated increasing feasibility to produce useful soft X-ray laser beams with high repetition rates in a typical, small, university-class laboratory - as opposed to the requirement of access to a national facility some 20 years ago. Experimental progress and the underlying theory associated with different plasma-based soft X-ray laser schemes are covered. In particular, grazing incidence pumping of transient collisional X-ray lasers, injection seeding of amplifiers and beam characterisation techniques are discussed in detail. The justification for this work is clearly demonstrated in the large section describing the wide-ranging applications now possible in areas as diverse as biology, chemistry and materials science, as well as in plasma physics itself. Plans and projections for new work are also presented, boding well for the future of the subject area. Progress in X-Ray Laser Facilities and Infrastructures.- Recent Progress in X-Ray Laser Research in JAEA.- Recent Advances on LASERIX Facility: Development of XUV Sources System and Applications. Perspectives from 2008 to 2010.- Recent Progress in Grazing-Incidence-Pumped X-Ray Lasers at Uni-BE.- Review on Recent High Intensity Physics Experiments Relevant to X-Ray and Quantum Beam Generation at JAEA.- Towards an 100 Hz X-Ray Laser Station.- Versatile High-Energy and Short-Pulse Operation of PHELIX.- Central Laser Facility High Power Laser Capabilities Applied to X-Ray Laser Science.- TARANIS: A Pump Source for X-Ray Lasers.- Photon Frontier Network.- Transient Collisional X-Ray Lasers.- Grazing Incidence Pumping (GRIP): Single- vs. Double- Pulse Arrangement.- An Improved Double-Pulse Non-Normal Incidence Pumping Geometry for Transient Collisionally Excited Soft X-Ray Lasers.- Generation of the Circularly Polarized X-Ray Laser Using the Pulse-Power Magnet.- Gain Saturation of the Ni-like Antimony Laser at 11.4 nm in Grazing-Incidence Pumping Geometry.- Temporal Coherence and Spectral Line Shape of a GRIP Transient X-Ray Laser.- High Repetition Rate X-Ray Lasers.- High Coherence Injection-Seeded Table-Top Soft X-Ray Lasers at Wavelengths Down to 13.2 nm.- Characterization of a Seeded Optical-Field Ionized Collisional Soft X-Ray Laser.- Investigation on the Spatial Properties of Silver X-Ray Laser Using GRIP Schemes.- Spatial Filtering of High Order Harmonics by an OFI Plasma Amplifier.- New Driver Laser System for Double Target X-Ray Lasers at JAEA.- Optical-Field-Ionised (OFI) X-Ray Lasers.- Toward Ultraintense Compact RBS Pump for Recombination 3.4 nm Laser via OFI.- High Brightness Optical-Field-Ionization X-Ray Lasers Driven in Plasma Waveguides.- Temporal Coherence and Spectral Linewidth of a Seeded Soft X-Ray Laser Pulse.- Theory and Simulations.- The Scaling of Recombination Following Tunnel Ionisation and its Suitability for Generating X-Ray Laser Gain.- Advances in Understanding the Anomalous Dispersion of Plasmas in the X-Ray Regime.- Recent Developments on Seeded or Unseeded Transient X-Ray Lasers.- Influence of the number of atomic levels on the modelling of collisional X-ray lasers.- Modelling of Capillary Z-Pinch Recombination Pumping of Hydrogen-Like Ion EUV Lasers.- Propagation of a High-Harmonic Pulse Through a Population-Inverted Medium.- Modeling of an Ultra-Short X-Ray Laser Pulse Amplification Through an Optical-Field-Ionized Gas Using a Maxwell-Bloch Treatment.- Effects of Inhomogeneous Incident Line Focus on 2D Hydrodynamic Behaviour of X-Ray Laser Plasma on Slab.- Excitation Rates for Transitions in Ne-Like Ni XIX.- Conversion Efficiency Calculations for Soft X-Rays Emitted from Tin Plasma for Lithography Applications.- Theoretical Investigation of Photo-pumping X-Ray Lasers Using K? Line from Solid Target.- High Harmonic Generation (HHG).- Coherent Water-Window X-Ray Generation by Phase-Matched High Harmonics in Neutral Media.- Relativisitically Oscillating Mirrors - an Ultrabright Attosecond Source.- Spectral Characteristics of Strong High-Harmonics Generated in a Two-Color Laser Field.- Diffraction Limited Harmonic Emission from Laser Produced Plasmas.- XUV Optics and Applications of X-Ray Lasers.- X-Ray Lasers as Probes of Plasma Parameters.- Advances in Nanoscale Resolution Soft X-Ray Laser Microscopy.- Experimental Diagnosis of Plasma Jets by Using X-Ray Laser.- Soft X-Ray Holography with Wavelength Resolution.- Ablation Measurements Using Ni-Like Ag X-Ray Laser Transmission.- High Sensitive Characterization of Microdomain Structures in PZN-PT (91/09) by Means of Coherent Soft X-Ray Laser Speckle.- Warm Photoionized Plasmas Created by Soft X-Ray Laser Irradiation of Solid Targets.- Development of Multilayer Optics in EUV, Soft X-Ray and X-Ray Range at IPOE.- Highly Efficient Surface Modification of Solids by Dual Action of XUV/Vis-NIR Laser Pulses.- Strand Breaks in DNA Samples Induced with LASERIX.- High Resolution X-Ray Laser Backlighting of Plasmas Using Spatial Filtering Technique.- Development of Soft X-Ray Fourier Transform Holography with Fresnel Zone Plate.- Lensless Imaging Using Table-Top Soft X-Ray Lasers and High Harmonics Sources Reaching 70 nm Resolution.- Gas Phase Study of The Reactivity of Optical Coating Materials with Hydrocarbons Using a Compact Soft X-Ray Laser.- Gas Phase Studies of Catalytic Processes Involving Vmon Clusters and their Reaction with Alcohols, Alkenes, Nox, and Nh3 Using a Desk-Top Size Soft X-Ray Laser.- Time-of-Flight Measurements of Ion and Electron from Xenon Clusters Irradiated with a Soft X-Ray Laser Pulse.- Calibration of a High Resolution Soft X-Ray Spectrometer.- XUV Probing as a Diagnostic of Rayleigh-Taylor Instability Growth.- Line Focus Geometry for Grazing Incidence Pumped X-Ray Lasers.- Resolution and Feature Size Assessment in Soft X-Ray Microscopy Images.- An Approach to the Generation of Uniform Line Foci for Use in X-Ray Laser Experiments.- Interferometric Lithography with a Desk-Top Size Soft X-Ray Laser.- Time-Resolved Fluorescence Spectrum of Wide-Gap Semiconductors Excited by 13.9 nm X-Ray Laser.- Alternative Approaches for Sources of Bright X-Rays.- Application of Extremely Bright and Coherent Soft and Hard X-Ray Free-Electron Laser Radiation.- Design Study of Compact Thomson X-Ray Sources for Material and Life Sciences Applications.- An Attempt to Generate an Inner-Shell Photo-Ionisation Pumped X-Ray Laser Using the ASTRA Laser at RAL.- Electron Self-Injection and Radiation in the Laser Plasma Accelerator.- Emission Spectroscopy from an XUV Laser Irradiated Solid Target.- Innershell X-Ray Laser in Sodium Vapor: Final Steps Towards Experimental Verification.